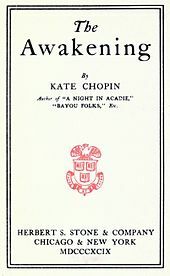 NPR has the Diane Rehm Show and on her show this morning she had a discussion on the book: The Awakening by Kate Chopin. At the time this book was written women were so disturbed by it that the book was banned. Now the book has been called a great feminist landmark. The Awakening is set in New Orleans and the Southern Louisiana coast at the end of the nineteenth century, the plot centers around Edna Pontellier and her struggle to reconcile her increasingly unorthodox views on femininity and motherhood with the prevailing social attitudes of the turn-of-the-century South. Edna is a mother who feels isolated, depressed and unfulfilled by her role as a woman during her time. It seems that Edna’s struggle is universal for many women/mothers; mothers who feel trapped by their roles, as if their talents and gifts are just a joke now, that they have become just mom and lost their spiritual-emotional selves as woman and Child of the Divine. Edna feels such pain in her life that at the end she commits suicide. A sad ending. But in her life Edna had women who supported her, Mademoiselle Reisz, especially; she is a woman who shows Edna that a woman need not be what society says you are to be. This book and the discussion on Diane Rehm struck me as important as we look that this weeks focus: Receive the Holy Spirit; and its sub-focus of birth. As a Catholic woman the Holy Spirit is the giver of life: that part of the Divine that comes within when we are conceived, form in our mother’s womb, in the Divine’s heart before we are born into flesh; the Holy Spirit comes to us over and over again into our lives in profound ways. We give birth to our children and more affectingly to our selves time and time again. We are co-creators with the Divine. Through those birthings we become truly more ourselves as grow from each change and growth of spirit and emotions. It is way as we grow old we can become more comfortable in our own skin/flesh. The Holy Spirit is a gift to our lives, one that helps us overcome those issues around us. It is important that we call upon the Holy Spirit that is within us, through it we reach out to the Divine, our connection to the Holy. We see this in today’s Gospel that God sent down his only beloved son to dwell with us and to show us that we have a right, an inheritance of God given power, to call on God when we are in need. Edna must have been so deep into her woundedness that she could not feel, sense the Holy in her life. To be in such pain that death is the only release, I know that God was there opened armed to receive with her with Great Love. You could definitely see your enthusiasm within the work you write. The arena hopes for even more passionate writers such as you who aren’t afraid to mention how they believe. Always go after your heart.